Begin each day with renewed faith in your creator and courage to live your life to the fullest. 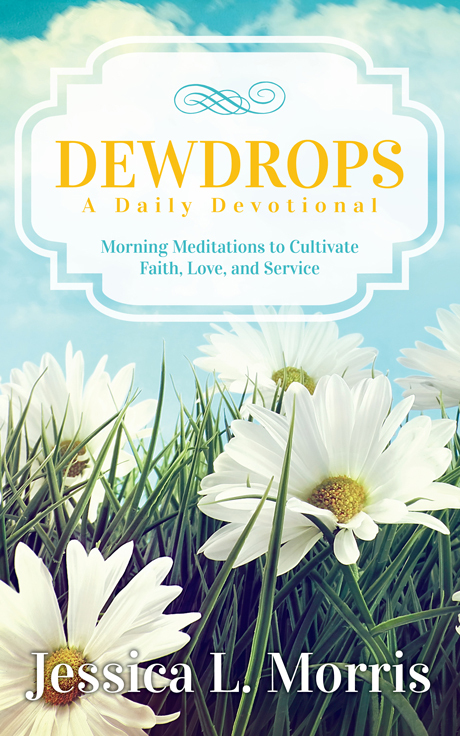 Dewdrops is an inspired daily devotional of meditations that will cultivate faith, love, service, and healing. It was written for everyone: the spiritually enlightened, those who are searching for spirituality, those simply needing answers to life’s many complexities, those recovering from addictions or abuse, those contemplating suicide, or those who are just seeking a way to enrich their lives. Dewdrops is a personal collection of powerful God-inspired messages from one woman who, through her faith, overcame addiction, abuse, and a close call with suicide. Dewdrops continues to empower her life as she practices each day enhancing her own spiritual journey. Wake up each morning and experience the peace that Jessica Morris and her readers enjoy every day. A day filled with purpose is a day filled with joy! Jessica L. Morris lives in Pennsylvania with her husband and their cat, Lincoln. Along with a career of over twenty years in higher education advancement, for the past fifteen years she has been committed full-time to recovery from addictions and the relationship journey with her higher power. This second “career” has challenged all of her lifelong beliefs, for which she is forever grateful. Jessica grew up with three siblings in small-town New Jersey, the daughter of an alcoholic minister. Her addiction to food is her earliest memory of childhood. Alcohol entered her life early, as well, and from there she endured a daily chase to find fulfillment in those two substances—which nearly resulted in death on several occasions. An obsession with boys and the need to be loved by everyone only added to the peril of her self-destructive path, but proved to be a blessing in disguise when a counselor suggested she seek recovery from her addictions. Through the process of recovery and further counseling, Jessica began to feel an intense draw to understand and know God. Having been raised in such a confusing religious setting, she tread lightly at first. As part of her recovery, she began writing of the abuse she had suffered, the constant fear in which she lived, and the loneliness she experienced. She delved into her past, faced her own character limitations, and spoke honestly with the counselors who were trained to help her. As a result of these actions, she remained clean from the addictive substances that once ruled her life. She found internal peace and contentment that she never knew was possible. Today, Jessica continues to search for a greater knowledge of her higher power, who she knows is God. She has spent recent years devouring books about God, spirituality, and historical accounts of the life of Jesus and his last days on earth. She has turned to television shows and podcasts of ministers recommended by friends. And most recently, the call to continue learning Godâ€™s word has compelled her to enroll in a seminary to work toward a master’s degree.